nice looking, goes with everything I have. These pretty pearl earrings are fashioned of sterling silver. Theearring set includes brown, grey, peacock, pink and whitebutton-shape freshwater pearl studs. All carat weights and measurements are approximate and may vary slightly from the listed dimensions. Treatment code N (White pearls) and D (Colored pearls). See Gemstone Treatments for further information. If you are looking for very small pearl earrings these will do well for you. I personally was hoping for closer to size 6 MM. All of these were definitely 5 mm. The brown ones were more of a strange copper orange color. Others were fine in color. The best way to keep a teenager out of your jewelry box is to get her pearls of her own! She has double piercing in both ears so this collection allows her plenty of options. The price is good so if she looses one...no big financial loss. Would recommend for anyone. Nice sets of earrings I love pearls and the different colors go great with many outfits. I even share them with my little daughter when she is dressed up. I love my purchase and great price. These pearl stud are nice for a change from daily earrings. Colors are true. Would recommend to a friend. I purchased these as a gift for my daughter-in-law and was very pleased with them. They do not come in any kind of a box so I am putting them in a small jewelry box (about 2" x 3") that has been mine and I know she will be very pleased with the whole gift. I bought this set for my daughter. The variety of colors was super but the quality is questionable. the stem breaks of the pearl stud. And so for three pairs Io have a complete earring and one separate stud and stem. These pearl stud earrings are the perfect size and offer a variety of colors to choose from; it makes it easy to wear them with almost anything. A must have for your jewelry collection. Love the pearls beautiful colors. More Fresh water pearl earrings! I now have a color of pearl earrings to go with just about any outfit of clothing choice. They are a nice size and I know I will be able to wear them and get a lot of use out of them.. I especially liked the teal greenish colored ones, this is a hard to find color and I wear a lot of this color of clothing. nice earrings to wear out. They will be nice for a classic look. Go well parceled out with the bracelets as last minute gifts to keep onhand for unexpected moments. Nice size; not too small or large. Colors are true to screen. This a wonderful gift for a little girl or young lady. 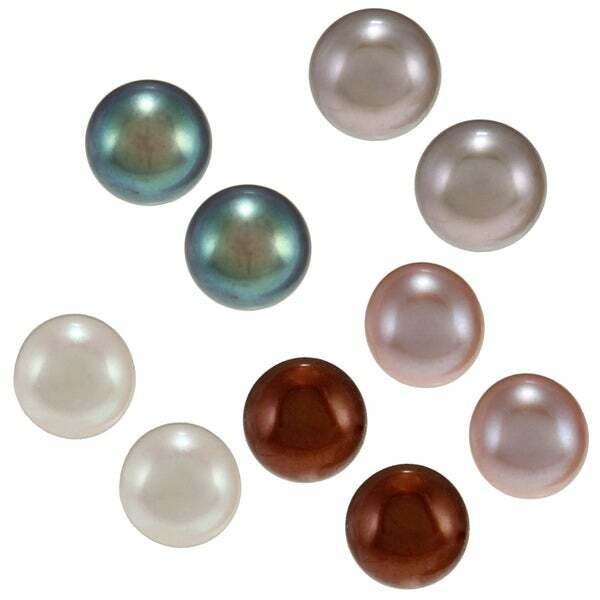 Pearls are all different colors and are not too big for a little ear. Great for adult who like more demure look. This set is great not only for the perfect size of the pearls but also the lovely range of colors which mix and match with any other jewelry you have. Not one pair of these earrings had a good match. They were so bad, in fact, I couldn't tell which earring went with which. For its value and variety. "How long are the backs on these earrings. I just bought a paid from a different store but the backs are too short so they are pressing too hard on my ears." Thank you for contacting us lauramurdoch. Approximately 9-10mm long. Please let us know if you have any further questions.